This set includes the difficult to find white gel pen refill!! Ideal for adult coloring books, scrapbooking, crafts, hand-made cards and invitations, technical writing, kids art projects, teachers, scribbling and doodling, graphic design, and much more! Makes a perfect gift for the whole family! SUNREEK gel pens are non-toxic, 100% acid free, and are made with high quality materials. The tips are designed for smooth ink flow and are 0.6mm to 1.0mm wide (fine tip). This best gel pen refill set dries quickly and won't smear, fade or skip. We take great pride in designing products that our customers love. But if you are not satisfied, we'll be happy to issue a full refund. Just make sure to contact us WITHIN 30 DAYS of your purchase date and we will get you taken care of. The gel pen refills are acid-free and non- toxic, also compatible with MOST 0.6-1.0mm ballpoint gel pens. This set includes 28 glitter, 17 metallic,16 neon, 4 classic, 15 pastel, 6 swirl, 14 glitter-neon. Includes most popular colors - Reds, Pinks, Oranges, Yellows, Greens, Blues, Purples, Browns, Fluorescents, White, Silver and Gold. Water-based and acid-free ink that doesn't bleed through normal paper. Perfect for continuous writing, drawing, coloring, doodling, and more! 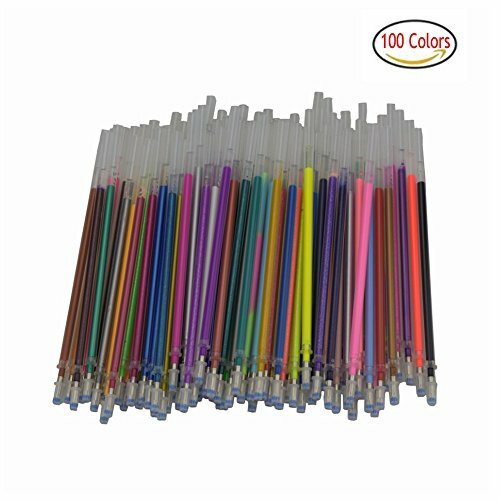 100 Refills save you money over ordering another Gel Pen set. More ink fill than most gel pens on the market. Last 2X as long. 100% SATISFACTION GUARANTEE -If you are not satisfied or would like to exchange your product, we are happy to do so WITHIN 30 DAYS of your purchase date. If you have any questions about this product by SUNREEK, contact us by completing and submitting the form below. If you are looking for a specif part number, please include it with your message.